Upholstery Cleaning Services: Where Should We Start First For Home Spring Cleaning? Where Should We Start First For Home Spring Cleaning? Spring cleaning is never an easy task for any home owner. When you start spring cleaning then most of the time you make many mistakes in it because you do not know things that you should do for this cleaning. In this requirement many people keep asking the same question where should we start first for home spring cleaning? If you also have the same question in your mind and you are waiting to get an answer for this, then you are at right place. 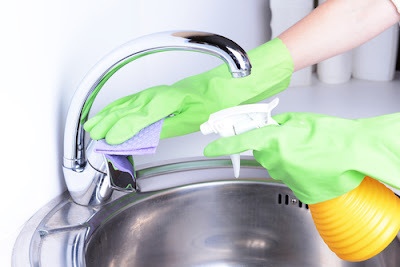 I won’t say there is only one thing that you should pay attention in your home spring cleaning, but if you can pay attention on these few things, then you will be able to finish this work in really smart manner. Get rid of old stuff: Before even starting the spring cleaning work in your home, it is extremely important that you get rid of all the old stuff from your house. If something is there that you are not using, then just throw it away from your house. If you can sell it, then sell it and that will do good for you. If you cannot sell that material because it is worthless, then also you should not keep it in your home. Keeping that material in your home will not only increase the work for your spring cleaning, but it will reduce your speed as well. Get rid of clutter: A cluttered home is never a good place for spring cleaning and you should always keep that thing in your mind. If you will have a cluttered home, then you will get frustration because of that cluttering and you will be able to pay less attention on the cleaning part. To avoid any kind of complication or issues, it is advised that you remove the clutter from your home. So, if you see some clutter in your home, then make sure you do not take it for granted assuming you will clean it later. Instead of that you should start the cleaning and arrangement of those things right away so you can have better spring cleaning. Clean higher area first: In your spring cleaning work, you should clean the higher areas of your home before the surface. When you clean the higher areas such as edge of your window and door, or the fan, then you drop all the dirt or residue on the floor. 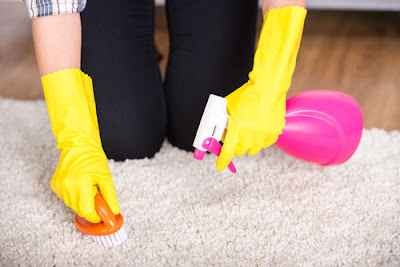 If you will clean the floor or lower area first, then you will have to clean it again and that will just double up your work. Needless to say, that will increase your frustration as well and you will not enjoy the spring cleaning work in your home. This simple rule is applicable in all kind of cleaning and you should follow this rule in this particular cleaning as well. 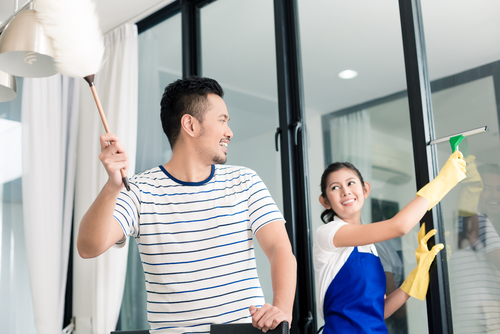 Clean your windows: In order to do proper spring cleaning in your home, it is advised that you clean your windows thoroughly. If you will clean your windows properly, then you will be able to have much better result in easy ways. When you clean your windows, then you can clean its edges as well as its glass as well. Many time people forget to clean the glass of their windows and as a result of that their entire efforts goes to vein. So, I would recommend you not to make this mistake in any condition so you can get the optimum result in this particular manner with great ease. Clean your cupboards: If you have dirty cupboard, then you cannot have any clean house in any condition. That dirty cupboard can lead you to a negative experience and it can also give a bad smell in your house. You can easily avoid these issues or minor problems just by cleaning your cupboards. To clean your cupboards you can simply remove dirt and dust from it before cleaning and later you can use some cleaning agents or solution for same. That will be an easy task and it will give optimum result also to you in easy manner. Start with inner rooms: In your spring cleaning you should always start the work with your inner room. I am giving this suggestion to you because when you start the cleaning from inside then you can take out all the dirt, dust and other things to outer rooms or halls. It will not increase your work by double and you will be able to have better cleaning as well. Also, when you do this cleaning, then make sure you clean every corner of your room. It will also make sure you get a clean place to rest during your spring cleaning work. If you will start it from outside, then you will not have any clean place to rest and your tiredness will even increase your work load. Check your refrigerator: To finish your home spring cleaning you must clean your refrigerator as well. Many people just keep using their fridge for several years without thinking about its cleaning. That is not a good practice to follow and it can lead you to many hazardous situations. To avoid that kind of mistake, you should make sure you clean your fridge. You should take out all the food from it, you should unplug it and you should clean it thoroughly. That may not be an easy task, but that is one thing that you should do to have effective spring cleaning in your home. Also, you should not ignore any kind of hidden places in this task. Under your bed, fridge, or sofa, there can be pile of the dust and dirt that need to be removed. You can have same kind of situation behind your mirror, movable storage spaces and photos as well. I don’t have to explain it to you that you should pay attention to these places as well before initiating your spring cleaning work. That minor attention can actually help you get much better result and you will be able to have a clean fresh and healthy home in a smart manner.